(Nanowerk News) XEI Scientific Inc, manufacturers of more than 1,100 EVACTRON® De-Contaminator Plasma Cleaning Systems for electron microscopes and other vacuum chambers, celebrated 20 years in the service of the electron microscopy community with a full agenda at this year's Microscopy and Microanalysis event held in Nashville in August. XEI was founded in 1991 to address contamination issues in electron microscopes. XEI president Ron Vane said "While the company's original plans included the use of a stream of clean, dry nitrogen to remove residual hydrocarbons, XEI discovered a plasma technique that is far more efficient. This discovery resulted in the birth of the Evactron product line, which led the way in new cleaning methods that utilize downstream plasma cleaning." Right from the company's very first shipments, XEI's Evactron De-Contaminators were well accepted, providing users with an efficient cleaning tool at a good price. Today, the product line is a key and enabling technology for today's high resolution and low kV applications and is becoming a standard on most new electron microscopes. Plasma cleaning is a requirement for nearly all types of beam microscopes including TEMs and is finding use in new markets to clean high value, sensitive products such as optical devices. Most systems are now portable and can thus support cleaning on multiple instruments in the laboratory. New applications are being developed, with specific interest seen from those working with EUV masks, e-beam writers, and the optics for synchrotrons. XEI's Evactron De-Contaminators are unique in that they use efficient hollow cathode technology to produce a cold plasma. Other ICP sources have inefficient designs where most energy is wasted as heat, and UV sources just do not deliver the same decontamination results of a cold plasma. M&M 2011 saw the successful launch of the Evactron CombiClean™ System, an all-in-one plasma cleaning solution that simplifies the control and operation of multiple plasma radical sources, allowing for Evactron in-situ SEM, TEM, and FIB cleaning, as well as desktop sample and specimen decontamination. It also allows for simultaneous cleaning of up to two TEM samples without risk of damage or recontamination of the samples. 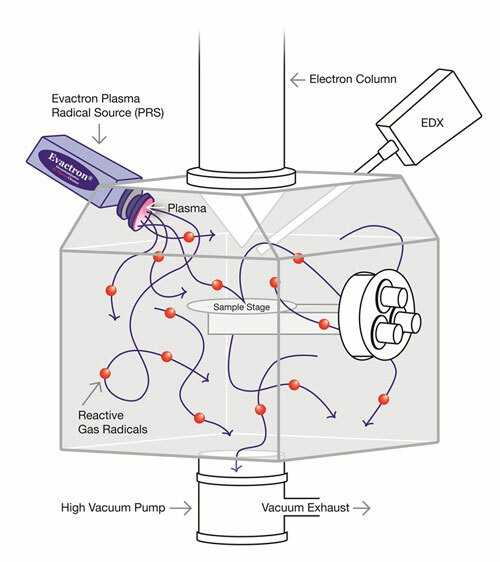 This launch followed on from the introduction of the Evactron SoftClean™ Chamber, which allows users to mount Evactron Plasma Radical Sources (PRS's) onto a desktop vacuum chamber, providing the same effective removal of problematic hydrocarbon contamination from samples, holders and other parts before they are placed in the electron column. The company continues to grow, obtaining patents to bolster its technology portfolio and introducing new products to aid scientists and technicians in maintaining clean vacuum and surface environments. The quality of XEI's Evactron Decontaminator line is backed by a five year warranty and adherence to all major industry standards including CE, SemiS2 and NRTL. XEI Scientific Inc. invented the Evactron De-Contaminator in 1999 as the first plasma cleaner to use a downstream cleaning process to remove carbon from electron microscopes. A proprietary plasma source uses air to produce oxygen radicals for oxidation of carbon compounds for removal by the pumps. Carbon-free-vacuum produces the highest quality images and analytical results from SEMs and other vacuum analytical instruments. XEI innovations include a unique RF plasma generator, a patented RF electrode, and easy start programmed plasma cleaning. All XEI products come with a 5 year warranty and are compliant with CE, NRTL, and Semi-S2 safety standards. XEI offers a variety of Evactron systems to meet user needs and has over 1000 installations around the world. For more information on products and services offered by XEI Scientific, Inc., see their website (www.evactron.c om).